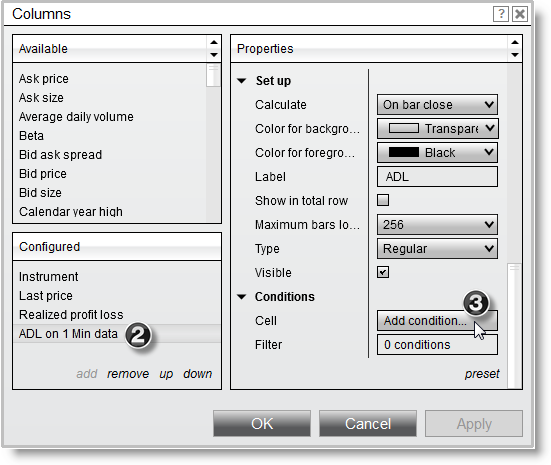 Market Analyzer columns can have cell and filter conditions applied to them for a more convenient display of information. Cell Conditions allow you to define the display behavior of a cell based on the cell's value, and are defined per column. 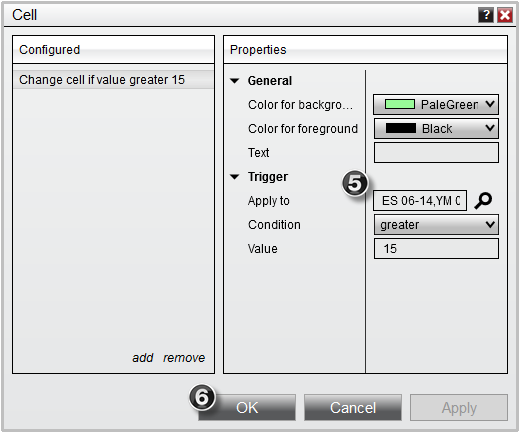 You can choose to alter both the color and text of a cell with Cell Conditions. 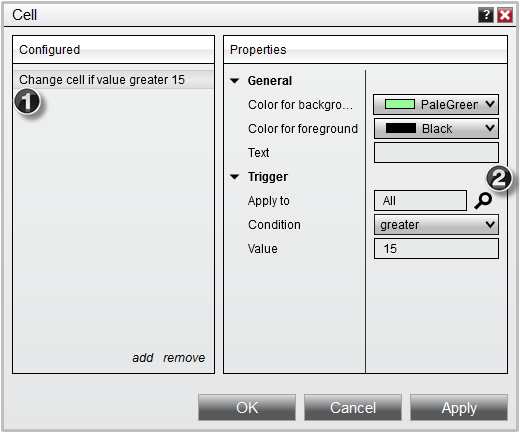 2.Select the column you would like to create a Cell Condition for in the applied column section. 3.Under the Conditions parameters section, move your mouse over the Cell field and then press the "Add condition..." button which will appear. You can remove a Cell Condition by pressing the Remove button. Cell Conditions are evaluated from top to bottom. 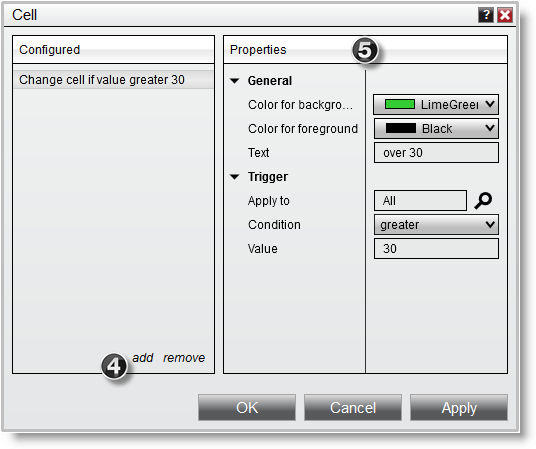 This will guarantee that a cell value over 100 will fall in the "greater than 100" condition and cell values between 30 and 100 will be triggered by the "greater than 30" condition. 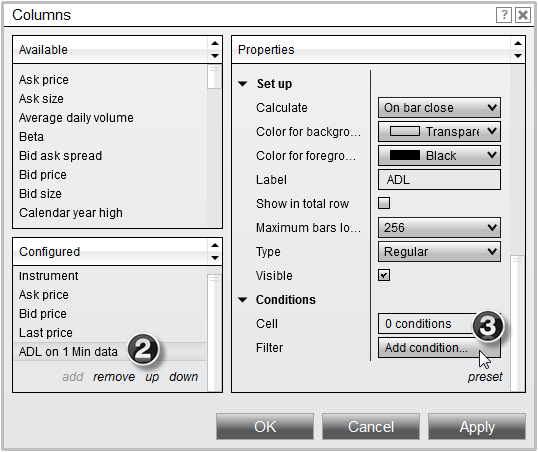 Filter Conditions allow you to define conditions that filter out rows from the Market Analyzer grid display based on the cell's value and are defined per column. 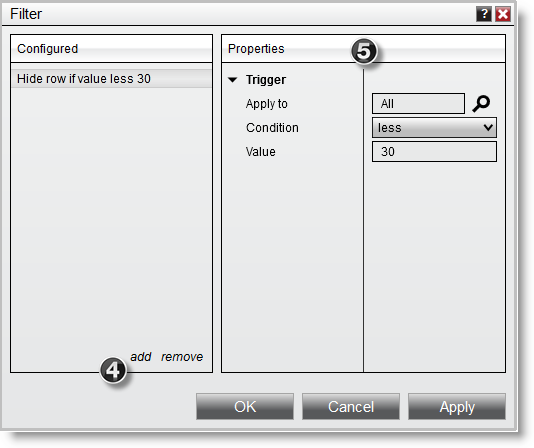 2.Select the column you would like to create a Filter Condition for in the applied column section. 3.Under the Conditions parameters section, move your mouse over the Filter field and then press the "Add condition..." button which will appear. You can remove a Filter Condition by pressing the Remove button. 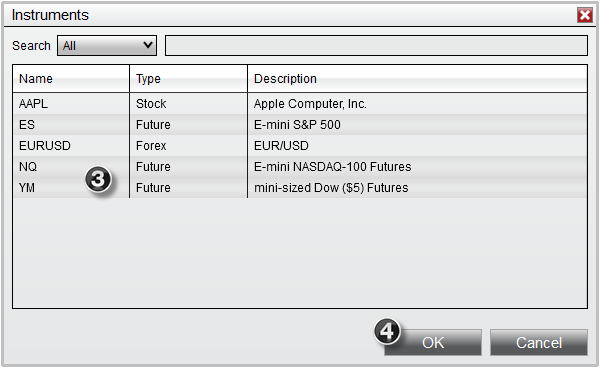 To enable/disable filtering press down on your right mouse button in the Market Analyzer window and select the menu Row Filter. When enabled, the Market Analyzer will filter out rows from the grid display based on the Filter Conditions of the columns. When setting up Cell and Filter conditions, the default behavior is to apply these conditions to all instruments in the Market Analyzer. •To select a consecutive instruments, click the first instrument, press and hold down the Shift key, and then click the last instrument. •To select non-consecutive instruments, press and hold down the Ctrl key, and then click each instrument that you want to select. 5. Your Apply to field will now list the instrument names you selected earlier, indicating that conditions will only be triggered on instruments contained in this list.